Spivi® combines the data with personal information such as age, weight and performance history it has on record, and generates a unique group simulation in real-time. 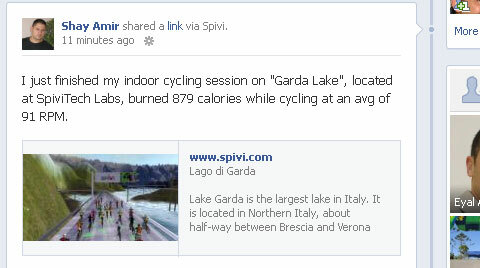 Spivi® makes the power based training programs easy to follow! Members can manually set their Functional Threshold Power (FTP) or let Spivi® update it for them automatically based on live class test and performance history. 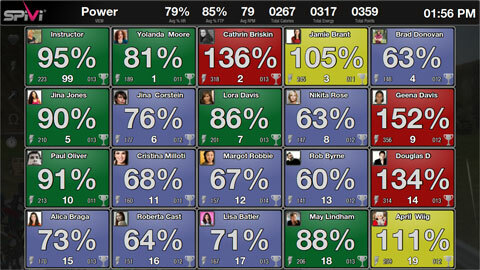 The Power View displays the %FTP of each member and real-time power output in WATT units. Just like with power, Spivi® offers dedicated view for Heart Rate. Members can manually set their Lactate Threshold Heart Rate (LTHR) and Resting Heart Rate (RHR) values on their user profiles. Alternatively, Spivi® can update the LTHR automatically based on live class test. 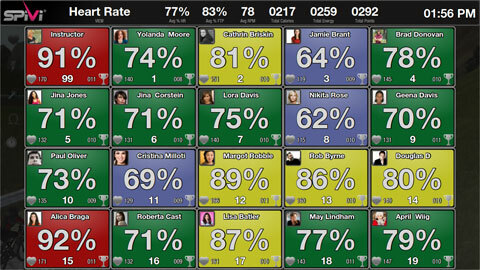 The heart rate view displays the %Max HR of each member and real-time heart rate in BPM units. Run Cadence oriented training plans with the Spivi® Cadence view. 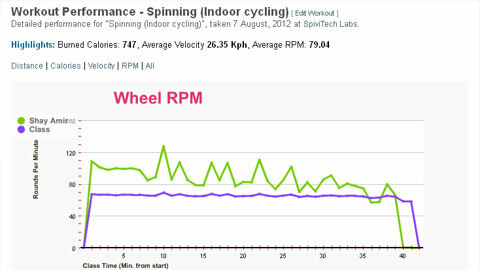 Instructors can focus on cadence training and show your members their real RPM values live! 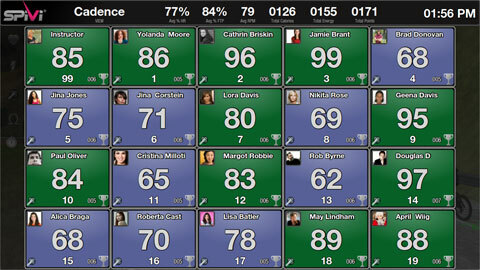 The cadence view displays real-time cadence of each member in RPM units. Using Spivi®, you can split your class into as many as 4 teams and let them compete with each other. In Team Mode, Spivi® splits the class into different teams according to the current team setup of the studio. Each team has its own unique color – Green, Red, Yellow or Blue, which lets you easily see who belongs to each team. 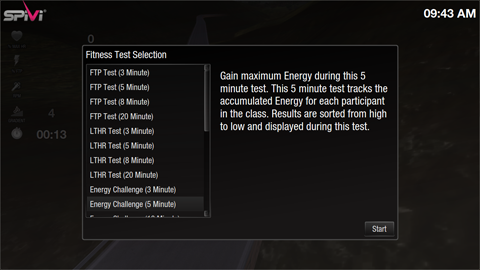 Run live fitness tests in class! 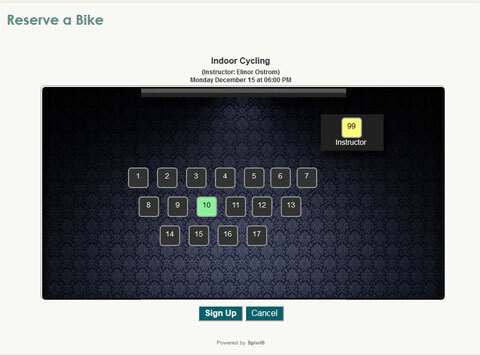 Spivi® offers various fitness tests such as FTP and LTHR to run live in class. After each test Spivi® displays the results and uploads them for future use. Fitness tests are great tool to improve member’s motivation and track progress over time. Your customers can use our widgets to track their performance over time, get better every time! 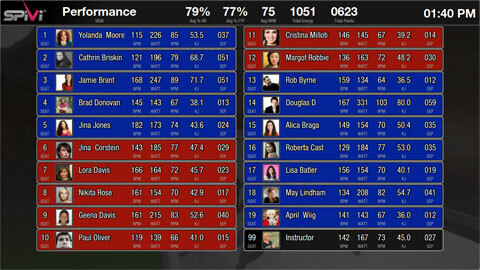 People can watch their effort compared to others in class, track their log and share their workouts data with others. Spivi® is integrated with the leading social networks available today such as facebook and twitter. Spivi® is also running on a dedicated community website here at www.spivi.com, allowing people to interact with other members from their fitness club and meet new people from others – world wide. Expand your local experience behind the club’s walls. 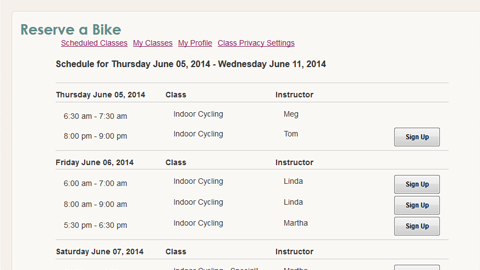 Spivi® provides an online class scheduler for your studio. Already working with Zingfit, MINDBODY or LiveEdit to manage your studio? Great! Spivi® works with all of them to offer you a transparent integration.